Omega Delta Phi’s main goal is to graduate each and everyone one of our Brothers. Omega Delta Phi exists to cultivate and develop ethical leaders. An education is the most important part of that formula. You are a student first, and graduation is your goal. To ensure this is happening, Omega Delta Phi, in accordance with the North-American Interfraternity Conference (the governing arm of over 70 national fraternities), has a minimum standard that all members must maintain at least a 2.25 individual GPA and a collective chapter GPA of 2.5. However, many of our chapters have a higher requirement for membership. Omega Delta Phi educational programs provide ongoing personal development for our members, allowing them to explore living the mission and values of the Fraternity. We are an organization that encourages members to evaluate their knowledge, realize their aspirations and become lifelong learners through their involvement in our activities and programs. By focusing on academics, members strengthen their commitment to the Fraternity and learn skills to positively impact their chapter, campus, local and global communities. Academics are very important to the Brotherhood of Omega Delta Phi. Each chapter has academic expectations and a strategy to help members meet academic goals, whether it’s study hours, study tables, study groups or other incentives. Many chapters award scholarships annually to recognize students who have maintained exceptional grades and shown leadership in the chapter. In spring 2016, more than $15,000 in scholarships were awarded. Each semester, the office of Undergraduate Affairs compiles grade information from each chapter to track progress. These reports are used to measure achievements and successes at a regional and national level. 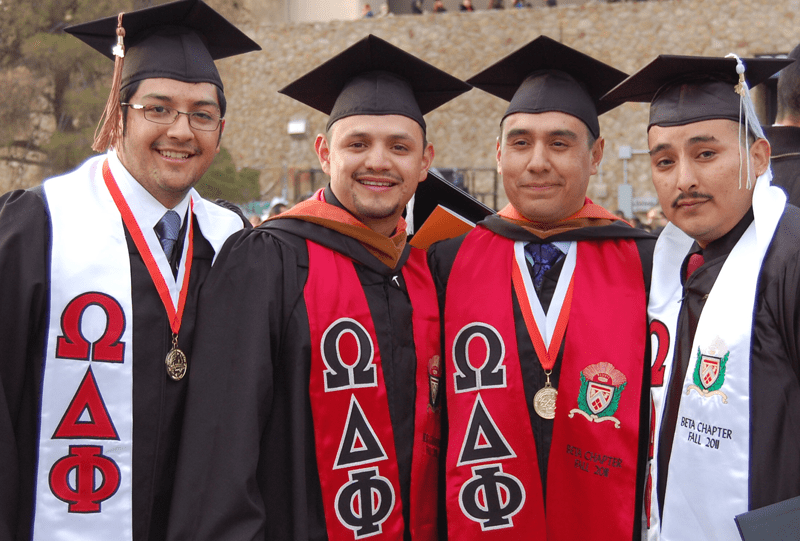 The men of Omega Delta Phi realize the importance of academic excellence. The goal of our fraternity is to graduate each Brother. Mandatory study hours for our Brothers help instill regular study habits that carry on for a lifetime. Our Brothers are also encouraged to attend workshops such as time/stress management, study/test skills, as well as resume writing and interview techniques. Over sixty percent of incoming freshmen will drop out of college before achieving a bachelor’s degree, but ninety-five percent of all Greek members graduate from college. We provide the conditions to encounter, ascertain, and receive the countless adeptness needed to take to the path of graduation and beyond. Omega Delta Phi has a great track record of Brothers who have graduated and gone on to great success.